Skateboard artists come from all walks of life and creative backgrounds. 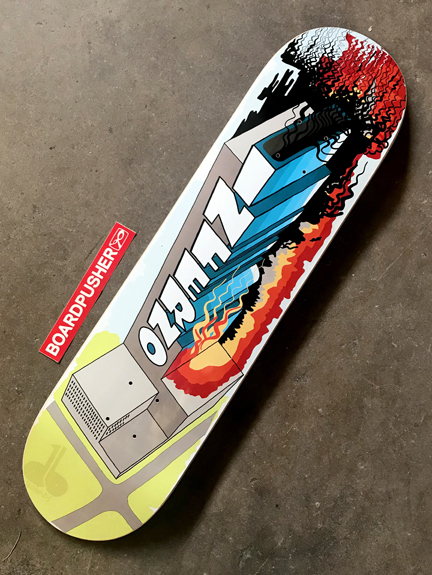 This week’s BoardPusher.com Featured Deck was designed by architect Dan Nutini. In his off-hours Dan dabbles in art and board design, incorporating building forms and perspective into his work. “Since I was young, I was always drawn to skateboard graphics and illustrations. They were just mesmerizing to me; so this has been fun to see what I can create while applying my own style.” Keep up with Dan’s art by following him on Instagram @dannutini. Doesn’t matter whether you have professional training or none at all, we make creating DIY custom skateboard graphics easy for everyone at BoardPusher.com.